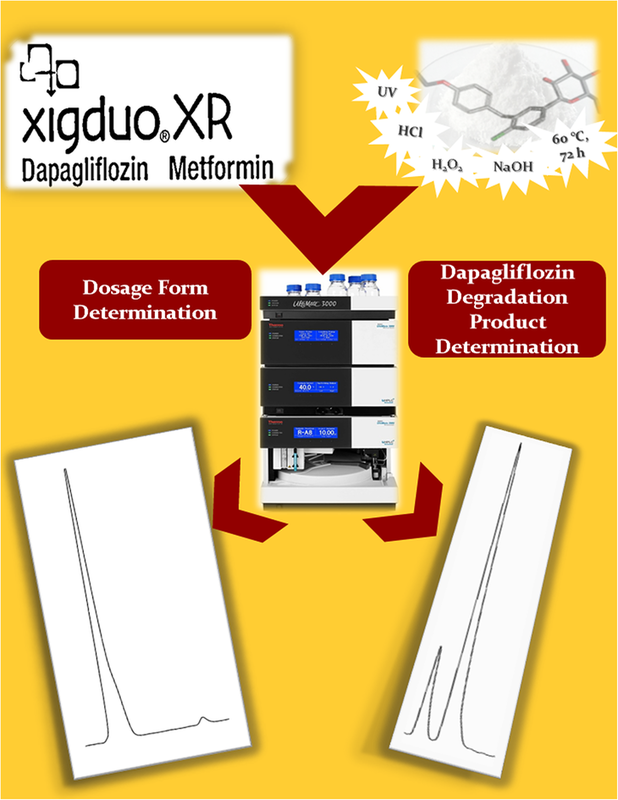 A novel ultra-performance liquid chromatography with UV detector technique was established for simultaneous determination of two antidiabetic drugs, dapagliflozin (DAPA) and metformin (MET), followed by a stress degradation study. 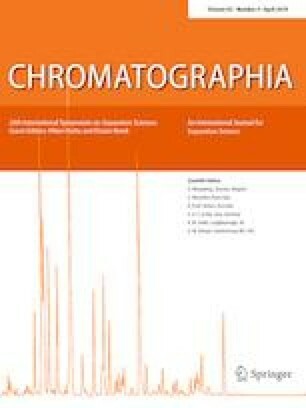 Main degradation product was chromatographically separated and precisely characterized via LC-MS/MS. Chromatographic separation done on a Symmetry® Acclaim™ RSLC 120 C18 column (100 mm, 2.1 mm, 2.2 µm), column temperature was maintained at 60 °C. Mobile phase was a mixture of potassium dihydrogen phosphate buffer, pH (3.5)—acetonitrile (50:50, v/v) at flow rate of 0.4 mL/min. The method has displayed an adequate detection at concentration ranges of 1–50 µg/mL for dapagliflozin propanediol monohydrate and 0.5–100 µg/mL for metformin hydrochloride. DAPA was then exposed to different stress conditions include alkaline, acidic, oxidative and ultraviolet light. A study of the degradation kinetics in alkaline medium for DAPA has proved that the degradation follows a pseudo-first-order reaction. The proposed method was effectively applied for the analysis of laboratory prepared mixtures as well as a combined pharmaceutical formulation with 1:200 ratio of DAPA: MET. No significant difference was found regarding accuracy and precision upon statistical comparison between the obtained results and those of the reported method. Validation was conducted in compliance with the ICH guidelines proving that method is selective, linear, precise and accurate. The simplicity and sensitivity of this method allows its use in the quality control tests of the two cited drugs. This study was self-funded, no fund is received. No conflict of interest of any kind.